We supply quality Hellebores to the retail nursery and landscaping industries during the main season from April to August. 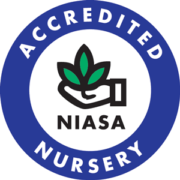 Post Office Farm Nursery is accredited under the NIASA scheme. Post Office Farm Nursery attends the Nursery and Garden Industry Association of Victoria Trade Day at Caribbean Gardens between April and August.